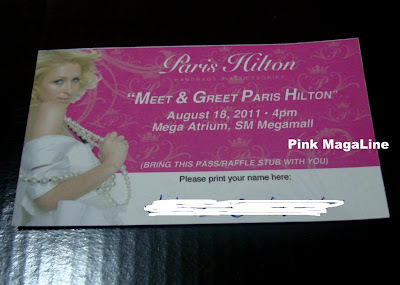 Pink MagaLine: Ready to Meet and Greet Paris Hilton? I was in Megamall today to do some errands. 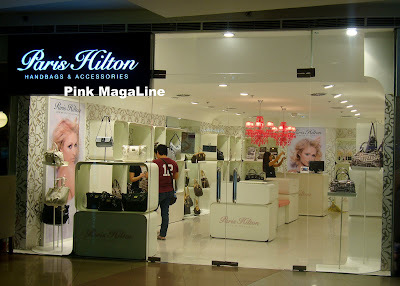 Passing by the Atrium, I saw Paris Hilton Handbags & Accessories store already open. I remember, it used to be covered by a white wall with Paris Hilton's face and caption that read "OPENS MAY 2011". I hurriedly walked towards the store, took a couple of photos, and checked every cute bag that I could find. There were just a few items to choose from and they have limited stock. If you are planning to meet and greet Paris Hilton on Thursday after the official ribbon-cutting ceremony but no pass/raffle ticket yet, I suggest you go early tomorrow. According to the salesladies, passes are limited to 100 people only and they have a few pieces left. Black and spacious, I spotted this one from outside the window before entrance. 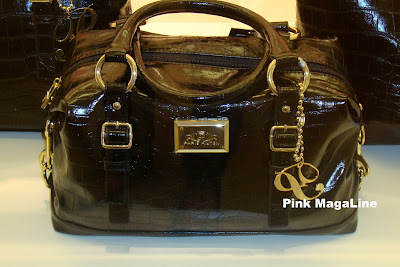 I already have a big and black work bag similar to it, so I looked for something smaller instead. Arrggh.. I know I was not suppose to buy a new bag again. My plan is to save for a Singer Talent 3323 sewing machine. It's just that hubby did a very good encouragement to grab the chance of meeting the heiress and purchasing a bag gives me a free pass/ raffle ticket for Thursday. 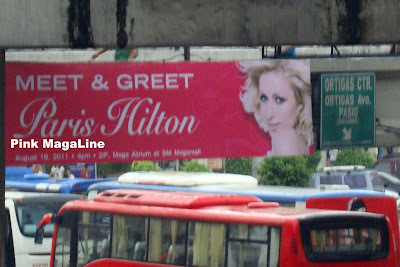 An ad in a footbridge connecting Megamall and Starmall says: Meet & Greet Paris Hilton August 18, 2011 4 PM 2F Mega Atrium at SM Megamall. I am expecting thousands of people to fill the Mega Atrium. While at the store today, a person who claims to be very close to The Pacquiaos told me that both Jinkee and Manny will be present to much-awaited event as well. Hmmm.. I guess it's true. Oi.. PHpurses the official twitter of Paris Hilton Handbags and Accessories twitted this just minutes ago. Coooooool!!!! @Sweet: Please wait until next week sis. Busy muna ako. Hahaha! cool :) I actually love Paris Hilton's designs, medyo chic and yet classy kaya lang since the label is hers, parang di ko type bilhin although I love her. Syanga pala, until now di pa ko nakakabili ng sewing machine, kinukulit na ako ng lola ko kasi moms here must have that. May Brother brand ba dyan?